The lockback style solves the primary issue of a pocketknife, its tendency to fold up if you use it incorrectly. More than once as a kid I nearly lost my carrying privileges, if not a finger or two, by trying to drill a hole in something with a folding blade. Even as an adult I feel lots better working with a lockback. 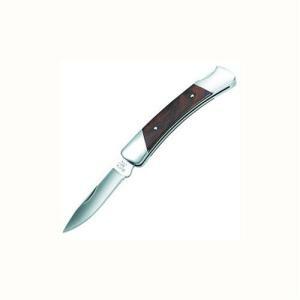 The Buck 503 Prince, with its 2 and a half inch stainless blade, has many of the advantages of a full size sheath knife, but still carries with the ease and safety of a pocket style. In wilderness conditions where you definitely don't want any accidents, it's an excellent choice, and it's light enough that you don't feel foolish for packing in extra weight. The model I carry is a special edition, but very similar in style; the Prince is a little smaller and probably makes better sense, with the wood grain Micarta handle that has become an industry standard. Rosewood might be more correct aesthetically, but it isn't better.